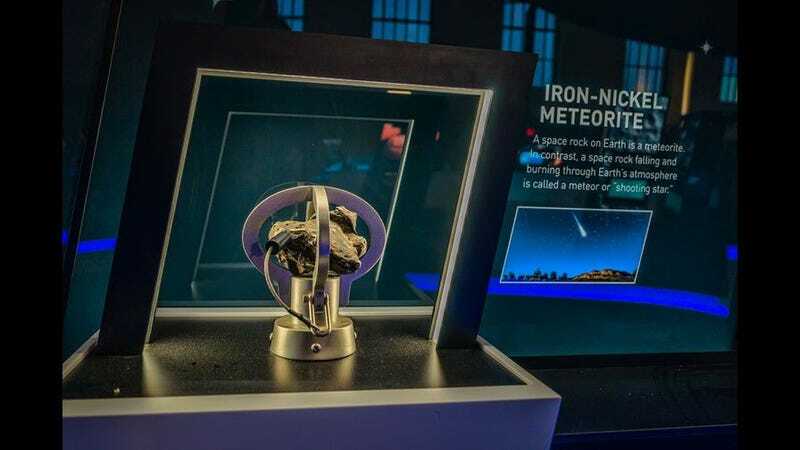 Police are searching for the thief, or thieves, who stole a meteorite from the Science Museum of Virginia last week. In most circumstances, a science museum heist to steal celestial space dust would sound like a plot for the forthcoming Avengers: Infinity War or even Ocean’s Eight. This is not one of those circumstances: Museum officials in Richmond, Virginia, say the stolen meteorite is worth only about $1,500. “When the (air-hockey playing) robot breaks, it’s a really big deal,” museum director Rich Conti told the Richmond Times-Dispatch. “We can buy a new meteorite on eBay and have it in by Tuesday,” said Conti. While some space rocks are valued in the millions, the Infinity Stone, this was not. It was an iron-nickel meteorite the size of a tennis ball. Police believe the theft occurred Thursday night. The display stand that housed it was reportedly disassembled and the stone was removed. While not priceless, iron-nickel meteorites are notable because they zoom by Earth at astoundingly fast speeds. There’s no word on the museum’s security measures, whether security cameras were present, or whether cameras managed to pick up any suspects. For now, police are noting that, although the stone is valued at $1,500, there’s an “extremely limited market” for space rocks. For all their trouble, the thieves may get nothing.